This connector allows users to quickly pass data from Amazon Connect into FreshDesk. 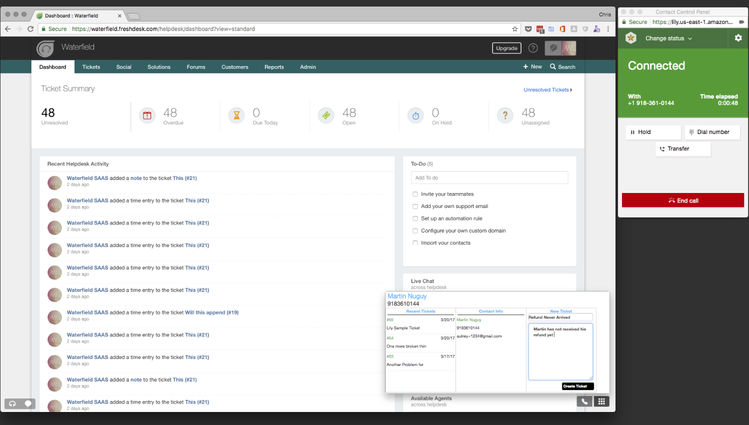 The Amazon Connect CTI Link allows customers to quickly integrate Amazon Connect call details into a clean, simple modal within the FreshDesk workspace. The app allows customers to quickly leverage Connect to pass call details like ticket number, caller ID, and caller history quickly and easily into the workspace without agent intervention or additional lookup. Rather than spending time on tedious redundant lookups, the FreshDesk integration will seamlessly allow agents to focus on servicing customers thereby reducing handle times and increasing customer satisfaction. - Easily move between recent tickets and the caller’s contact info from within the CTI UI. - A link to call details inside Connect, including the recording, is added as a note to the last ticket the agent accessed during the phone call. ** Amazon Connect is currently only supported in the N. Virginia region in the US. Other regions will be supported soon. Performance can be impacted by attempting to use Connect instances from parts of the world where another region would be more appropriate. 1. Enter the name of your Freshdesk subdomain. If you log into voicefoundry.freshdesk.com, you should input voicefoundry. Replace the text MYCONNECTALIAS with the subdomain associated with your Connect instance. Replace MYFRESHDESKSUBDOMAIN with the subdomain for your Freshdesk instance. 7. Choose JSON from the "encoding" select list. a. Replace MYFRESHDESKSUBDOMAIN with the subdomain associated with your Connect instance.